L.A. Unified won’t schedule a mediation date and is stalling. The District makes this statement without providing any reference to where they found the information so it is impossible to determine what the union actually said. However, the timeline of events does not seem to support the District’s terminology. 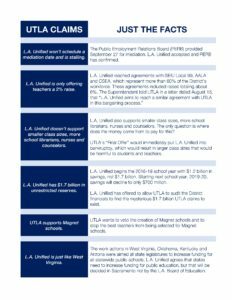 In July, UTLA did formally declare that “contract talks between LAUSD officials and the teachers union had reached an ‘impasse.’” According to the union, the Public Employment Relations Board (PERB) “confirmed that talks with the district are at a deadlock [and] appointed a state mediator.” While initially “district officials disputed the claim that negotiations had reached impasse”, their fact sheet states that they have now accepted PERB’s findings and a mediation date has been set for September 27. L.A. Unified is only offering teachers a 2% raise. 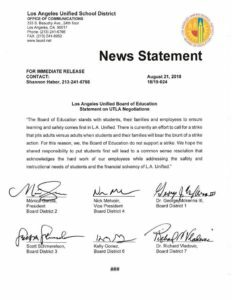 The LAUSD states in its fact sheet that they have already reached agreements with the three other major unions that “included raises totaling about 6%.” It also states that “The Superintendent told UTLA in a letter dated August 15, that ‘L.A. Unified aims to reach a similar agreement with UTLA in this bargaining process.’” The wording of this sentence is important because it weaves a public relations narrative without crossing the line into a lie. During the negotiating process, only offers made during official bargaining sessions are binding. 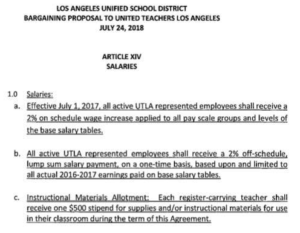 On July 24, 2018, the District officially offered UTLA represented employees “a 2% on schedule wage increase” plus a “2% off-schedule lump sum salary payment” and a “$500 stipend for supplies and/or instructional materials for use in their classroom during the term of this Agreement.” The letter mentioned in the “fact” sheet is not in any way binding. It should also be noted that last year the Board members received a raise of at least 174% and now make as much as $125,000 per year. Superintendent Beutner lead a study group that came to the conclusion that “LA Unified provides a higher average teacher salary and higher average healthcare benefits than do [unnamed] peer Districts.” Despite not having any professional experience in education, Beutner has a base salary of $350,000. This was awarded to him after his supporters originally suggested to the Board that he would not take a salary. L.A. Unified doesn’t support smaller class sizes, more school librarians, nurses, and counselors. A provision that lets “the district skirt rules on how big classes are allowed to be” would be eliminated, resulting in smaller class sizes. Every LAUSD school would have a full-time nurse. Every middle and high school would have a full-time librarian. The District says that it supports the union’s initiatives but asks “where does the money come from to pay for this?” In other words, while they do not actively oppose these concepts, they also have not prioritized them in past budgets. Instead, the District spent $154 million to purchase and renovate its headquarters on Beaudry from “investors, which included the firm headed by billionaire and city schools activist Eli Broad”. The Belmont Learning Complex project cost over $400 million after the District built (and rebuilt) the school atop an “allegedly toxic site”. Over $1 billion was spent on the failed iPad project. The cost for the botched MiSiS system was north of $111.5 million and the Miramonte settlements cost students $139 million. The District also loses funding everytime they approve a substandard charter school. L.A. Unified has $1.7 billion in unrestricted reserves. The District’s fact sheet claims that the reserve is actually $1.2 billion. According to the budget, it is actually $1,907,667,702.07. However, after subtracting off budget items, including a reserve for a potential salary increase, this reserve drops to $707 million. This assumes that the budget has been properly constructed. According to historical spending patterns, the District should spend about $350 million for textbooks and supplies. The latest budget allocates “more than $700 million for these materials.” After scrutinizing the District over the last several years, it seems that a deficit is consistently forecast for the third year out only to eventually turn into a surplus as time passes. The stakeholders of the District would benefit greatly if UTLA takes up the District’s offer to allow them “to audit the District financials”. Magnet schools are the only school format that has been shown to significantly improve student performance. Therefore, if both sides truly care about the students in the LAUSD, expanding this choice is something that they should both be able to get behind. Unfortunately, they cannot. In the “facts” document, the District states that “UTLA wants to veto the creation of Magnet schools and to stop the best teachers from being selected for Magnet schools.” This is a statement that is blatantly untrue. In fact, a District spokesman has stated that the union’s proposals would “effectively limit the number of new magnet schools”. Since the proposal only applies to entire schools that convert into magnet schools, “limit” is a more accurate description. Schools that add a magnet program or entirely new magnet schools would not be affected. L.A. Unified is just like West Virginia. It is understandable that the LAUSD would want to distance the possibility of a strike after the successful work-actions in West Virginia, Oklahoma, Kentucky, and Arizona. While the labor movements in these states “were aimed at state legislatures to increase funding for all statewide public schools”, this only tells part of the story. These movements were also about standing up to protect public education, which has been under attack by not only the Republican party but also the corporatists within the Democrat party. Nowhere has this been more evident than on the LAUSD School Board. By forcing through the hiring of Beutner without any public input, the charter block on the Board purposely put someone with anti-union views at the helm of the District. “Hard Choices” is a constant marketing message of this new Superintendent. It often means that District students will suffer while charter schools are allowed to operate without accountability while draining money from public schools. In this way, L.A. Unified is, indeed, just like West Virginia. Leaving this off the “fact” sheet was not an oversight. Almost 25 years ago, the LAUSD signed off on the Sandra Smith Consent Decree which mandated a series of steps that the District would have to undertake to ensure that children with special education needs received the services that they were entitled to. A child who entered the LAUSD when this agreement was signed has already graduated and the terms of this agreement have still not been satisfied. Despite this record of failure, Beutner has made it clear that special education programs are destined for cost-cutting. Instead of giving up on these children, the contract proposed by the union would “reduce the number of students assigned to one special education teacher.” Having personally witnessed my docile child get lost in a classroom full of squeaky wheels, I can think of no better way to improve the education that children with moderate to severe special needs receive. As previously stated, Superintendent Beutner has no professional experience or training in the field of education. UTLA leadership is comprised of people who are education professionals. Yet Beutner has stated that deciding “what tests students take” is not something that the LAUSD “would, should or could bargain with labor over.” “Under a UTLA proposal, teachers would be required to give only the standardized tests required under state or federal law”. While the union proposal is a step in the right direction, it does not go far enough. Under state law, parents have a right to opt their children out of all standardized testing. Unfortunately, LAUSD teachers are not allowed to inform parents of this right. By instituting an opt-in system, all parents would be informed of their rights before their children were forced to take these tests. In the end, parents will ultimately decide who wins this fight. If students are sent through picket lines to be taught by unprepared administrators and scabs, UTLA will quickly cave and business as usual will continue in the LAUSD. However, empty classrooms would force the District to look elsewhere in the bloated bureaucracy for the cuts needed to give students the education that they deserve. My two LAUSD students and I will be glad to join their teachers on the picket lines. I hope that the union stays true to its word as negotiations continue. My daughters are depending on it.